Bendable Bright Light: This small flexible light provides extra light without taking up any counterspace. 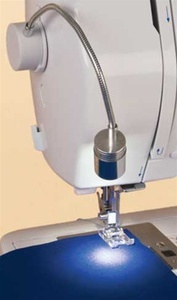 It conveniently snaps into an adhesive bracket that can be mounted onto you sewing machine to provide pure white light for your detailed projects. 100,000 light hours, 120 volts. One mounting kit included. A small brilliant flexible LED light for spotlight illumination. Provides pure white lighting for those hard to see places. 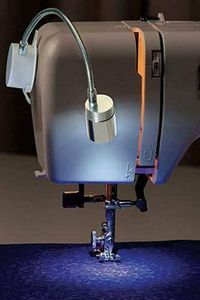 Light snaps into an adhesive bracket that can be mounted to the side of a sewing machine. Great for sewing machine, power tools, workshops, and craft areas. The quality metal flexible arm and metal light housing are very durable. No batteries needed. Energy efficient LED with 100,000 hours life of light. No bulb to replace. The LED Bendable Light makes a great reading light! Comes with an adhesive bracket. Optional mounting kit is available separately. 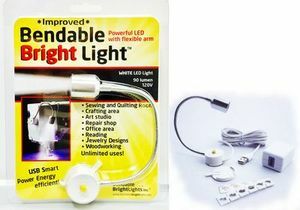 Upgrade your sewing machine light with this energy efficient LED Bendable Bright Light! 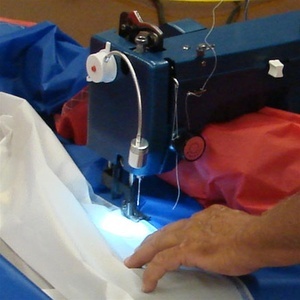 This light illuminates your sewing machine bed unlike any traditional light you've ever used. The LED Bendable Bright Light is energy efficient. According to the manufacturer, this light can run up to 12 hours a day for 20 years (100,000 hours) with virtually no heat emitted. It’s compact and uses no counter space, making it an excellent addition to any craft room or workshop. I have the earlier model 50 lumen version of this lamp. After only a couple of years, it appears that the wires within the plug box have pulled loose. It is Not repairable in my skill set. The weight of that box is excessive therefore stretching the wires out of place. So, if you purchase this light, be careful when removing the cord from electric source and lift the plug box fully in your hand--don't dangle the socket box at the end of the wire.